Maya Lin unveiling Under the Laurentide. 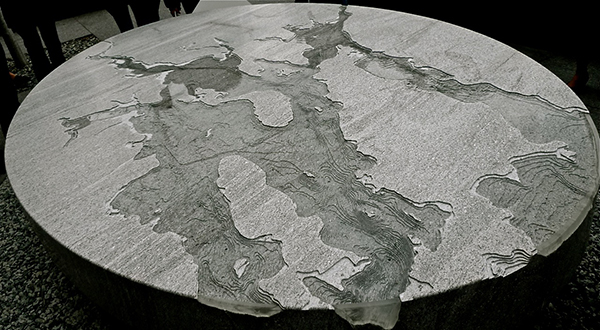 Earlier this year, on Earth Day at Brown University in Providence, Maya Lin unveiled a water table sculpture, Under the Laurentide. Having a new piece by America�s leading landscape artist was quite an event for the Ivy League school and for New England. This is actually Lin�s second Rhode Island work, following an installation in Newport two years ago called Queen Anne Square. That homage to the spirit of the early 18th-century town also includes a water table, joining those she has done in honor of women at Yale University in New Haven, Connecticut, and at the Southern Poverty Law Center in Montgomery, Alabama. Lin�s Narragansett Bay with Conanicut Island in the center, and Aquidneck Island to the right. Maya Lin acknowledges that she �loves natural phenomena and exploring terrain� (her presentation at Brown featured a rousing pep talk for saving the earth, which bemoaned the fact that pollution drove the sturgeon from Narragansett Bay). 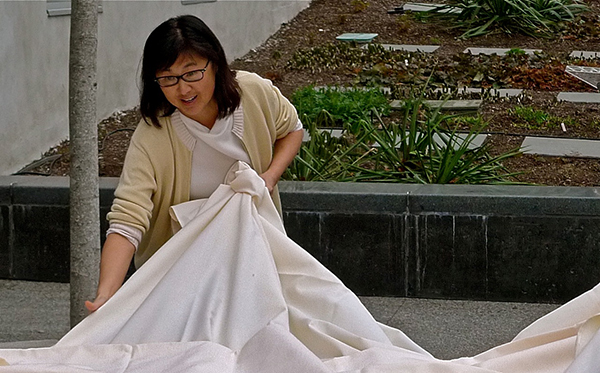 Besides her water tables, Lin has done a series on rivers, which she formed using silver and gold pins, and she did a wire sculpture of San Francisco Bay. 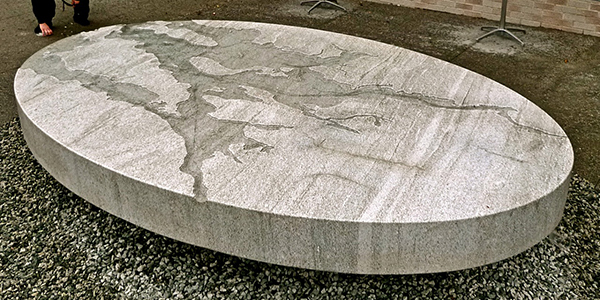 Lin�s tribute to Rhode Island�s geological past is the latest addition to Brown�s public art collection. The eight pieces installed over the last decade and a half hardly constitute notable works of art as some are too similar to corporate headquarters decorations. The last new artwork before Lin�s was Indomitable, a curiously androgynous bear, rearing in front of the new fitness center. Indomitable by Nicky Bibby in bronze is 14-feet tall. Toshiko Mori renovated the Environmental Research building, and it was the former chair of the Department of Architecture at Harvard who introduced Lin to Brown. 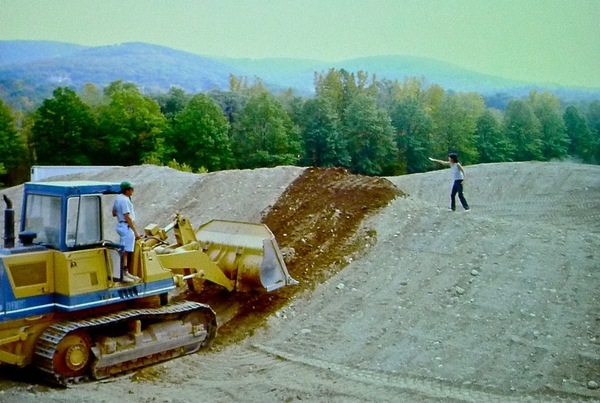 Mori urged Brown to commission one of Lin�s dramatic earthworks called Wave Fields. One can imagine the hesitation an aesthetically unadventurous urban school might have about giving over a chunk of a quadrangle to a conceptual earthwork. Yet, given the overly quiet nature of the Laurentide water table, one wishes that Brown had allowed Lin greater creative rein. Great design is always at your fingertips! Read Design New England�s May/June 2015 issue online!